The scope of degraded rivers and streams is difficult to overstate. However, the cost of restoration makes it difficult to scale up treatments to the scope of the problem. This workshop was intended to look at ways of extending restoration dollars further through cheap and cheerful restoration. We discussed the principals and focused on examples of ways of increasing structural complexity in streams and rivers (e.g. increasing wood loading and prevalence of beaver dams). 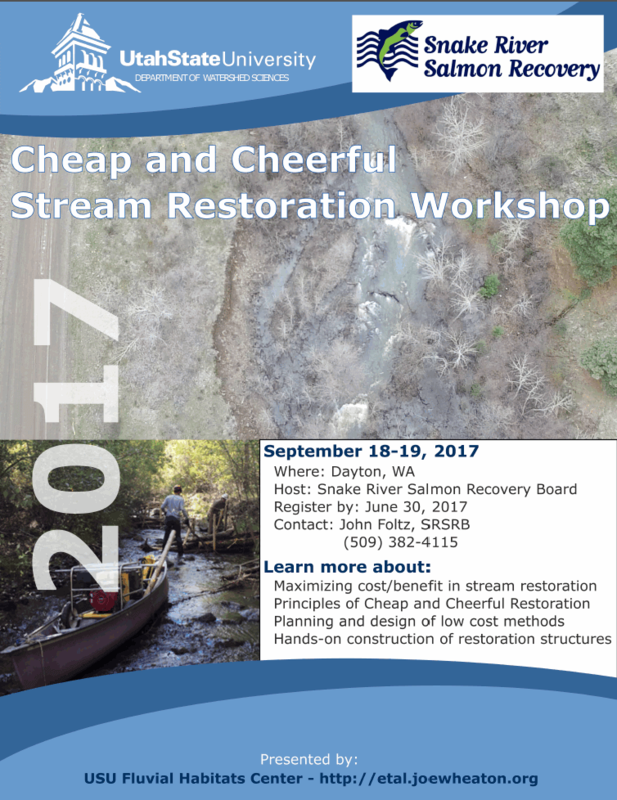 This workshop was conceived and organized by Steve Bennett and John Foltz (Snake River Salmon Recovery Board) in response to interest in the Snake River region about 'cheap and cheerful' restoration. The Snake River Salmon Recovery Board found the funds to offer this workshop to participants free-of-charge. The instructors donated their time. ELR, Anabranch Solutions and Yakama Nations all provided construction equipment and materials for the hands-on field demonstrations. Professional credit was administered by Utah State University. Each day we spent the first morning in the classroom in Dayton discussing topics and listening to presentations from the instruction team. We spent the first afternoon and most of the second day in the field actually doing hands-on demos and seeing some restoration projects. Participants got to participate in design exercises, building BDAs, building PALS, and using a grip-hoist to pull some large trees and woody debris into the channel. 2016. Bouwes N, Weber N, Jordan CE, Saunders WC, Tattam IA, Volk C, Wheaton JM and Pollock MM. Ecosystem experiment reveals benefits of natural and simulated beaver dams to a threatened population of steelhead (Oncorhynchus mykiss). Scientific Reports. 6: 28581. DOI: 10.1038/srep28581. Pollock M, Wheaton JM, Bouwes N and Jordan CE. 2012. 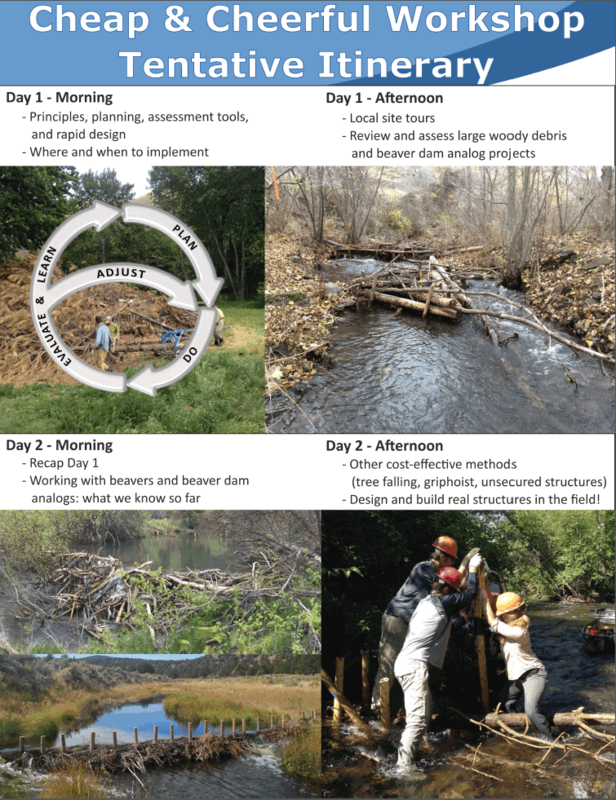 Working with Beaver to Restore Salmon Habitat in the Bridge Creek Intensively Monitored Watershed: Design Rationale and Hypotheses. NOAA Technical Memorandum, NOAA Northwest Fisheries Science Center, Seattle, WA, 108 pp.